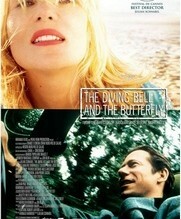 Mathieu Amalric. Emmanuelle Seigner. Marie Jos�e Croze. Anne Consigny. Max Von Sydow. Drama. True Stories. Disability/Handicap. Cannes Best Director. Biopic. Medical. 01 Nigel's Choice. 1990s. Rob Recommends. Peoples' Choice. 01 Will's stamp of approval. 01 Adam's Faves. Recommended. On December 7 1995, Jean-Dominique Bauby was the French editor-in-chief of fashion magazine Elle. Three weeks later, after a massive stroke, Bauby awakes from a coma, an active mind trapped inside a dead body, his only contact and communication with the world the ability to blink his left eyelid. Adapted from Bauby's memoirs, "The Diving Bell And The Butterfly" is an extraordinary flight of the imagination rooted firmly in the realities of the narrator's new world. Beautifully filmed you are overwhelmed by the feeling that this, initially fickle, ambitious man has been given, however painfully, the opportunity to realise not only the beauty of his own imaginings but the innate beauty of all those who have quietly, simply struggled to help and love him.